Sandy Madero, WOW manager, and Alan Lehmann, director of finance and social enterprise, pose with the check. Project Place’s Working Opportunities for Women (WOW) social enterprise may be our newest trainee business, but it’s already helped COOP’s MicroCreamery increase sales! 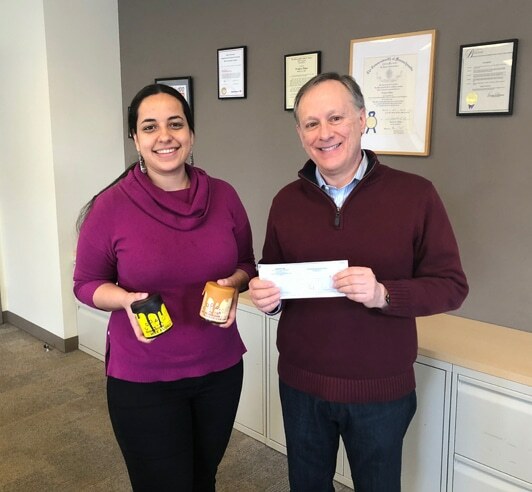 Sandy Madero, WOW manager, and Alan Lehmann, director of finance and social enterprise, recently received our first revenue-sharing check from COOP’s from the sales of specialty desserts that trainees helped produce, package and sell. We are proud that our trainees are contributing to a successful business and are thankful to COOP’s for giving Project Place trainees the opportunity to learn business logistics on the job. Visit the WOW website to purchase products made by WOW trainees, including hot fudge, salted caramel and a new mocha sauce from COOP’s.